We were driving home from a friends house the other day and my husband pointed out some really tall sunflowers in a yard as we passed by. He loves sunflowers and has done a few paintings of them. He said, “You should take a photograph!” Of course we were already past it on a one way street, and anyway I didn’t have my camera with me and was really not in the mood to go back. Later that day I realized I needed to take some library books back to the library, and the library was near where we had seen the sunflowers. I took my camera and went. It was late in the afternoon by this time, and a windy day. The sun was right behind the flowers from where I stood, but if I moved right or left I would get houses or trees in the picture. I wanted sky & flower. The flowers were waving like flags and it seemed like poor conditions for a photograph. However, I decided to use the conditions creatively, to make them work for me. 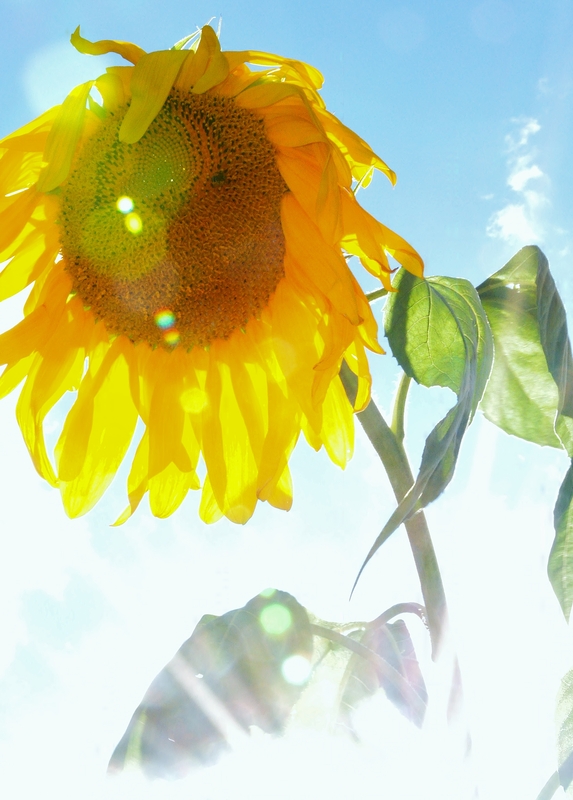 I didn’t want to take just an ordinary photo of a flower anyway, so I aimed right at the sun hoping to get a flare. I took a series of photos but this is my favorite. It prompted me to write an article for my husbands art blog, and I even added these to my portfolio. It was my husbands love of sunflowers, and my love for him, that prompted this creation. Ah yes, shooting flowers outside. 🙂 Great photo. Love it! oooh! That is a beautiful photo! I love sunflowers. (I had red and orange and yellow sunflowers as my wedding bouquet.) You are very talented! I am already following you via GFC, but I stopped by from MBS Friday hop and am saying hi! Thanks for visiting my blog and for following me. I subscribed to your email. I am very impressed with your website! Have fun on the weekend blog hop.